Transfer by bus from Lima to Paracas. Upon arrival, transfer to the hotel in Paracas. We will visit the Paracas National Reserve, protected area to preserve the various species of wildlife that live in this sanctuary. Its an area of 335,000 hectare, of which 35% belong to the mainland and 65% to the islands and 65% in marine waters. In the reserve we find about 216 species of sea birds: migratory, residents and / or endemic such as: white sandpiper (Calidris alba), the western sandpiper (Calidris mauri), the Semipalmated sandpiper (Calidris pusilla), the Flamingo (Phoenicopterus chilensis), among others, and 300 species of fish. Inside the Reserve, Paracas Bay is an important ecological area, characterized by its calm waters. You can enjoy a beautiful landscape, complemented with good cuisine and the magnificent beaches of the reserve. 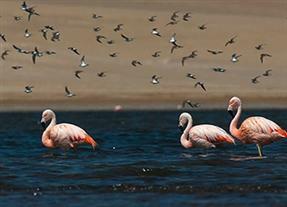 We can see the flamingos which were source of inspiration for the making of Peru national flag colors. There are plenty of rock formations located between the beaches of Supay and Yumaque. 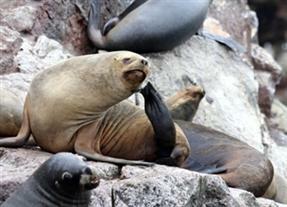 We will isit the Lagunillas beach before returning to Paracas. Departure to the Ballestas Islands, using modern speed boats, where we observe "the candelabra" is a large petroglyph. During the trip we can spot dolphins and lots of sea birds. The Ballestas Islands are composed of rock formations where there is an important marine fauna with guano birds like: guanay cormorants, boobies, pelicans and mainly the Inca tern (lorosterna inca). You can also appreciate Peruvian penguins (Humboldt pinguins). Also in these islands we can see varieties of seals (fur seals and wolves droll) and other mammals, that live in this natural refuge. After our visit to the islands, we will head to Tambo Colorado Archaological Site, military administrative center dating back from the Inca times (Late Horizon, 1440- 1532 AD). It was decorated in red, white and yellow colors. The archaeological site comprises six groups of buildings arranged around a trapezoidal plaza. It is one of the few archaeological monuments, which its walls are well preserved, even though it was made of mud bricks. 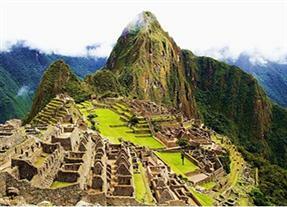 It was built druing the Pachacutec Inca times. Departure to Ica, and enjoy a city tour. We will visit the Min Square, colonial houses, The Ica Regional Museum, where we will see textiles, ceramics, mummies of the Paracas Culture, and all the the five regional cultures: Paracas, Nazca, Wari, Chincha and Inca, like utensils, musical instruments, Quipus, etc. There is a room with explanation of the cranial deformations, samples of trepanation, trophy heads and food. On the second floor, there is a collection of the colonial and republican era, with paintings and furniture preserved. Also a scale model of 1/500 of the Nazca lines can be seen. We also will visit Wineries and Pisco Distilliries, to know the process of making peruvian wines and the Pisco. We can also taste them. 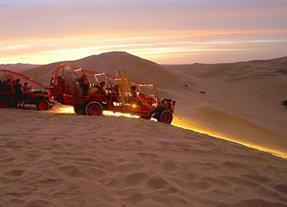 Later we will visit the Huacachina Oasis, a place where adventure sports like Buggies and sandboarding can be practiced. Early in the morning, transfer to the Nazca Airport. In the waiting room you can see a video where you learn about each figure and their explanation. 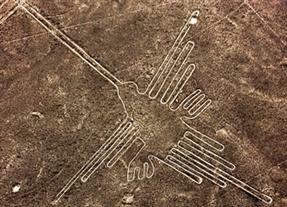 We will flight over the Nazca lines where we will see the famous figures like the spider, hummingbird, monkey, etc. These detailed drawings and lines with geometric and zoomorphic shapes range in area comprising 50 km long and 15 km wide. Many theories are woven around these geoglyphs about its use and origin. Some researchers date the age of lines in 550 AD. Regarding their use, Dr. Reiche believed that they were used by ancient Peruvians as a gigantic solar and lunar calendar. Among the largest, we find the bird of almost 300 m, the lizard of 180, a pelican of 135 m, a condor of 135 m, a monkey with 135 m and a spider with 42 m. Besides we see: a whale, a dog with long legs and tail, two llamas, diverse birds like the the pelican, the gull, the famous hummingbird and the parrot. In the category of reptiles, a lizard, that was cut to build the south panamerican road, an iguana and a snake. On the other side, we observe the impresive figures of the monkey, the snail, the spider, among others. We visit the Antonini Museum where we will appreciate the Nazca culture in all its aspects, like ceramics, garments, and scale models of the Nazca lines: spider, monkey, hummingbird among others. After our flight, we visit the Chauchilla Cemetery, This great necropolis dates from 1000 A.D. It offers a variety of types of tombs in terms size and shape, the same that have been built with rectangular adobes. This is one of the largest cemeteries found in the valleys of Nazca. In the afternoon, we will explore the Cantalloc Aqueducts, These aqueducts are attributed to the Nazca culture (Early Intermediate, 200 AD-700 AD). Of aqueducts found 46, 32 remain in operation today. They were made with stones, slabs and trunks of Huarango to capture the SUBWAY · water lines.They call attention to the "Puquios" ventilation ducts that spiral down to the ground and which can obtain better quality water. 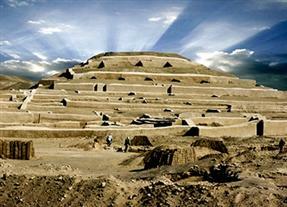 We will visit this morning the Cauachi Archaeological Complex. This complex belongs to the Nazca culture (Early Intermediate, 200 BC-700 AD). Its central sector is composed of several pyramids built in adobe, and it is considered the largest public architectural complex in South America. In some temples like in the Great Temple, it has been confirmed the existence of large enclosures whose roofs were supported by dozens of columns. It is one of the largest archaeological complexes in the world with aproximately 24 km and inside a ceremonial center dating from the early era of the Nasca Culture. Bus from Nazca to Arequipa. We begin with a visit to the viewpoints of Carmen Alto and Yanahuara, then continue with a walking tour visiting The Main Square, Cathedral, main colonial houses, church, dome and cloisters of the Society of Jesus, St. Francis Church and The Santa Catalina Monastery, is a real citadel of Colonial Arequipa, occupying an area of ​​twenty thousand square meters. Here you can see enclosures that were built according to the needs of the nuns, who were the daughters of the most distinguished families in the city. The charm of this citadel is in the strength and plasticity of their areas. Then we will visit the Andean Sancturaries Museum, which main attraction is the Lady of Ampato or "the girl of the ice", a prehispanic frozen body in better condition worldwide, popularly known as Juanita. This museum was inaugurated on March 26, 1997, to show the world the findings of the Sanctuaries of the High Southern Andes Project. In the museum, we can see ceramics, textiles, metals, and the frozen body of Juanita. 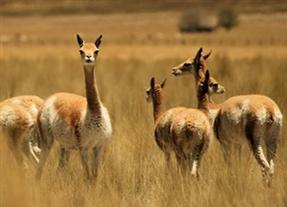 We ride north, along the Chachani volcano and then we get to Pampa Cañahuas which is the Vicuña National Reserve. We will also be able to observe the Chucura Mountain and see the snow on the peak, the Toqra Lake and Patapampa, and the Andean Viewpoint from where we can see the Ampato Mountain, Hualca-Hualca, and the Andes. We arrieva at Chivay. Lunch (free), in the afternoon we will hike through surrounding areas of Chivay for 1 1/2 hours. After the hike you can enjoy the thermal baths of La Calera. Peña folk night with show. We go to the the Cruz del Condor viewpoint, to see the spectacular flight of the condors, from where we also observe the depth of the Colca Canyon. We will stay here for around 1 hour 30 min. then return we will walk from "the Condor Cross" to the "Priest Cross" for 1 hour. Then we visit the traditional villages of Pinchollo, Yanque and Maca, where we see hanging tombs, amphitheatres, churches and terraces. We arrive at Chivay. Time to enjoy lunch. We will travel by motor boat to the Uros floating Islands. You will have the feeling you are walking on a water bed, but it is quite safe ans stable to walk on. 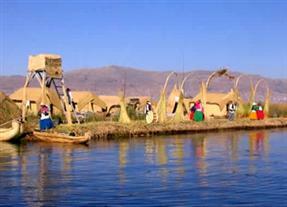 We will visit some houses of the legendary Uros, fishermen that have made the use of reed a way of life. We will continue to the Amantani Island (about 3 hours by boat from the Uros).You will be welcome by your host family and "will be adopted" by them. Your host family will serve a typical lunch made from natural and organic ingredients. There are some fun activities like hiking to the high point of the island to watch the sunset. After dinner your host family will dress you up in traditional local costumes and take you to the community hall for a small celebration. 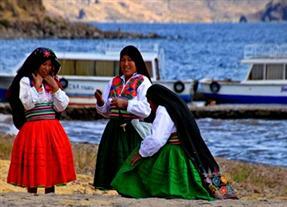 We will depart from Amantani to Taquile Island, where slowly we climb up to the village on a walk of about 50 minutes. There we can see a native community. Its people are skilled weavers and have preserved many ancestral manifestations. Lunch. We usually go down by the west side of the island through a staircase of more than 500 steps from where the views are spectacular. Then we sailed back to Puno for 3 hours. Arrival in Puno. Pukara: The Pucara Culture dates back to 300 years B.C. It is characterized by large buildings by way of a great pyramid that integrated pre-Hispanic city where monuments sculptural, stelae. 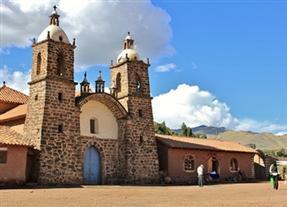 It is the most important ceremonial center of the Altiplano. In the museum you can find out the source of the Pucara culture through litho sculptures and ceramics. La Raya (4,335 msnm): The highest point of the route 4.335 m., Photo shoot at Nevado de Chimboya, is the boundary between Cusco and Puno. Sicuani - Buffet Lunch- Restaurant Canchis 11 (3,450 msnm): This consists of food of the Andes with topical preparing food, international food and Novo Andina, the diet includes (boiled vegetables Salad buffet, tickets including ceviche and other) (soups passengers included for vegetarian options) (main dishes with meat, poultry and fish in eight varieties, including options for passengers warniciones vegetarians) (7 varieties desserts including fresh fruit and ice cream in the area) hot drinks like coffee, teas , tea and milk. (cold drinks are not included). Raqchi- Templo de Wiracocha (3,450 msnm): Raqchi, is an Inca archaeological park located in the district of San Pedro, Province Canchis. The structure of the most important archaeological site is the Temple Raqchi Wiracocha (the supreme god of the Incas) because of its iconic buildings, a huge two-story rectangular structure that measures 92 meters long by 25.5 meters wide and about 9.80. tall. Its central wall is made of finely carved stones. The base has a height of about 3 meters. adobe (earth bricks with sun-dried straw), the walls are 1.65 mts. thick at the base and 1.30 meters. Approximately at the top. Andahuaylillas (3,093 msnm): where you will visit the Temple of San Pedro Apostol Andahuayillas known as the Sistine Chapel of America, being a work of the Jesuits dating from the sixteenth and seventeenth centuries. The church walls are covered with frescoes and amount of roof has a decoration of flowers with gold flakes also see many tables decorated in gold leaf in them enhances the picture of the Virgen de Asuncioh. Today we will visit Maras Salt Mines, where the most important salt mines of the region are still exploited since the Inca times and the colonial period. 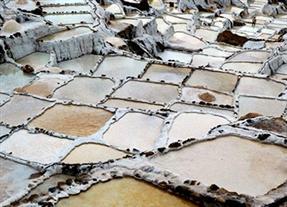 It was the largest producer of salt in the southern part of the central mountains. Then we explore the formidable Moray Archaeological Complex, conformed by admirable systems of terraces that overlap concentrically, taking the form of a giant amphitheater. Moray is a system in concentric terraces. It is said that this place, at the time of the Incas, was a center of agricultural experimentation; It was possibly a production of seeds at different climates, possible as each level represents a different climate from the rest. According to scientific research, Moray should also be considered a center of astronomical research center in which seasonal changes were controlled through the sunlight and the shadows in the high andean eastern mountain range. We go back to Cuzco. 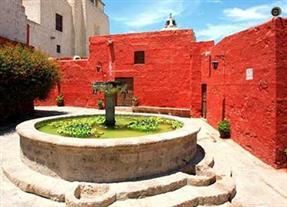 03 nights accommodation in Arequipa with breakfast included. 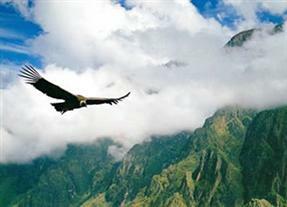 01 night accommodation in Colca (Chivay or Yanque) with breakfast included. 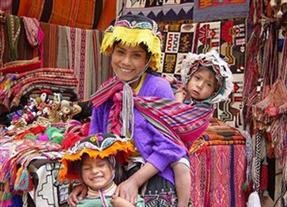 02 nights accommodation in Puno with breakfast included. 01 nights accommodation in Amantani Island with breakfast, lunch and dinner included. 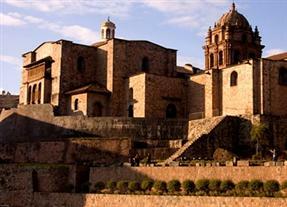 05 nights accommodation in Cuzco with breakfast included.